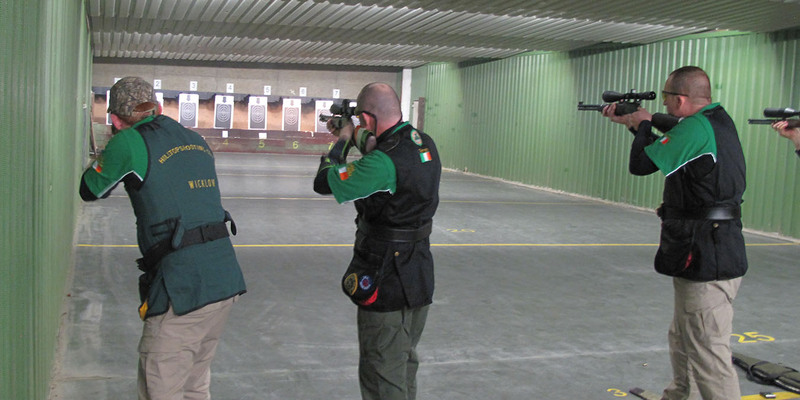 Three Wicklow sharp shooters were part of the eleven members of the National Association of Sporting Rifle & Pistol Clubs (NASRPC) squad that recently competed in the German Open European Gallery Rifle Championship – and won! Two five man teams, led by Team Captain Declan Byrne from Arklow, with Simon Caroll from Roundwood and Denis Cummins from Greystones, along with Karl O Brien from Gorey, are all members of Hilltop Target Shooting Club located in Tithewer, Newtownmountkenndy. Members of the club are regularly to be found on the Irish International Teams and are all accomplished National sportsmen. Team Ireland won the Smallbore Gallery Rifle International Match series, beating the hosts Germany by a mere 6 points out of a possible 6000 on offer, with Great Britain taking 3rd a further 15 points behind, In the Centrefire Gallery Rifle International Match, Ireland were just beaten into 2nd place by Great Britain by a margin of 9 points, Captained by Declan Byrne, who competed on both team accompanied by fellow Hilltop Shooting Club’s Denis Cummins on both teams with Simon Carroll competing with the Smallbore team. In Individual Competitions, the Wicklow Shooters picked up a total of 10 Individual awards, which is fantastic, with the level and numbers of competitors from various countries in attendance at the competition, In all Team Ireland picked up 44 medals, and while Wicklow supplied the majority of the team, the squad and teams also had members from Wexford, Cork, Kildare and Dublin.